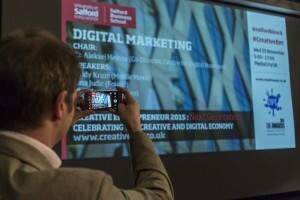 In 2018, I completed a PhD in digital marketing at Salford Business School, University of Salford. This page outlines my journey and how you could also do a DBA or PhD in digital marketing online or face to face. Read on to find out how. I have been interested in online, Internet based communities since the mid 1990’s in my BSc in Electronic Imaging and Media Communications at Bradford University. When I graduated in 1997, I went to work at Salford University, developing a new business online community called The Virtual Chamber and helping Manchester to get online. At that time, the web was quite new and social media as we know it today, did not exist. Online communications were confined to things like Internet Relay Chat (IRC), Multi-User Dungeons (MUD’s) and forums. As time grew on, we started to use forums and programming our own online community games such as a Fantasy Band League. I had a career as a web developer and programmer, but I never lost my love of virtual communities and network games. I created an online forum for my friends, pre-Facebook and as more people got broadband, we then moved on to new and exciting social media platforms. How can I do a PhD in digital marketing? The web has become more social and with the rise of smartphones, this provides an excellent opportunity to explore the power of social media for digital marketing. My PhD in digital marketing focusses on social media and football. These days, I am a lecturer in digital business and teacher in digital marketing. I also run a professional development course at MediaCityUK called Search and social media marketing. I would be more than happy to talk to you about my PhD in digital marketing and what is involved in doing a PhD. We sometimes have some funded PhD’s at Salford Business School, which might mean, we can pay you to do a PhD in digital marketing. There is also our new DBA (Professional Doctorate) or the Online PhD. The best place to start is by writing a great proposal, take a look at our PhD proposal guide. You can also see our online PhD or standard PhD routes here. Please drop me a line for more information on this or see this page for more details.